I had a difficult time choosing the name of the dog who will reside at the fishing lodge in the upcoming Hollywood Hero novel starring Halden Armstrong and Wendy Davila. Your suggestions were awesome. I narrowed it down to a final three: Chessy, Harley, and Brandy. 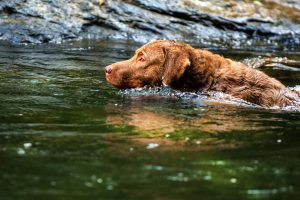 By the way, the names of our family’s Chesapeake Bay retrievers were Cindy and Taffy. I do seem to like dog names ending in Y, apparently. Finally I decided on “Brandy“, because the name reflects the rich color of the after-dinner drink. I can picture guests at the lodge sitting by the fire with a glass of brandy in hand and the old dog Brandy laying on the scarred hardwood floor at their feet. I am now ready to get down to writing Book 3 in the Hollywood in Muskoka series. You can see the Hollywood Hero cover and blurb here. Brandy will also appear in Book 5, which will be Wade’s love story. 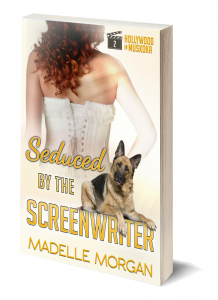 Congratulations to Marlene Blakney who won a paperback copy of Seduced by the Screenwriter! Ex-cop Catrina Turner is lonely. After a traumatic recovery dive she quit the force and ran away to remote Muskoka with Titan, her retired police dog. They provide winter security for luxury lake houses owned by rich celebrities. Her PTSD, a closely-held secret, makes a relationship impossible…until a handsome visitor makes a tempting proposal. Screenwriter Chett de Groot needs a hit to save his career. He accepts a movie star’s offer to use her secluded lake house as a writing retreat, and discovers a closet full of her old movie costumes. Bored, freezing in Muskoka, and desperate for inspiration, Chett entices the beautiful security guard to wear costumes and role-play in seduction scenes. They discover how satisfying acting can be. Soon Catrina is ad-libbing passionate lines in scorching “performances” that knock his thermal socks off. A film producer makes Chett an offer that will put him back in the game. But if Catrina finds out what he did to close the deal, will he lose her forever? Catrina’s path to love and healing is Book 2 in the Hollywood in Muskoka series. This curl-your-toes romance can be read as a stand-alone short novel. Love music? Enjoy the optional “soundtrack”—a playlist. The ebook is available on Amazon.com, Kobo and iBooks for $3.99.